We’d love your help. Let us know what’s wrong with this preview of The Window by E.H. Graham. However, when the window in her living room provides her a fr Brianna Scott has nothing but her window and pet cat to entertain her. Stuck inside for more years than she can remember with a degenerative disease, she has become invisible and has retreated from her small community. Only Jim, the town grocer and old high school friend, seems to care about her lonely existence. To ask other readers questions about The Window, please sign up. There is a new anthology formed by eight authors based on a novel by Brit Lunden – BULWARK – that serves not only as a fascinating adventure into a strange fictional world, but also as a point of departure for some of the authors who, like Brit Lunden, have taken a step away from children’s books and have entered the world of adult fiction. E.H. (Erica) Graham fits that direction, balancing her career with children’s books by following the path toward adulthood literature. It is a smooth transition and suggests that perhaps Graham will extend this new path. For those who have yet to discover her, author/illustrator/ Speech Therapist Erica (E.L.) Graham graduated from Southern Illinois University of Edwardsville with her Master of Science Degree in Speech Language Pathology: she also holds her Certificate of Clinical Competence with the American Speech-Language Hearing Association. 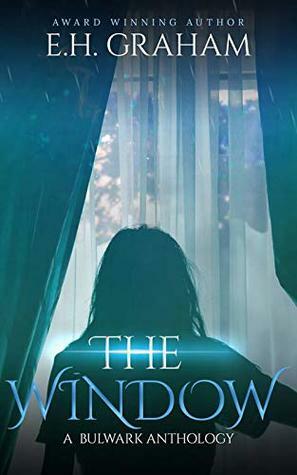 The Window is a brilliant achievement because although the majority of the story happens in a single house with one character that has mobility issues, it is still intense and gripping. Like Phone Booth or that film where it's just Ryan Reynolds trapped in a box the whole way through, the isolation of Bree gives you time to delve into her character and understand the frustrations of her plight. You feel her fear as she uncovers more of the secrets she shouldn't be digging into too. The tension is The Window is a brilliant achievement because although the majority of the story happens in a single house with one character that has mobility issues, it is still intense and gripping. Like Phone Booth or that film where it's just Ryan Reynolds trapped in a box the whole way through, the isolation of Bree gives you time to delve into her character and understand the frustrations of her plight. You feel her fear as she uncovers more of the secrets she shouldn't be digging into too. Oh, I loved this one! I love Brianna, she's the kind of character that engages you, and makes you want to know more. The mystery of the children kidnapped, the relation with the disappearance of her own sister and the effect that that had in her life, her own isolation and mobility issues, Jim... all factors that construct a wonderful story with a more than surprising end. WOW!!! This Brianna Scott has nothing but her window and pet cat to entertain her. Stuck inside for more years than she can remember with a degenerative disease, she has become invisible and has retreated from her small community. Only Jim, the town grocer and old high school friend, seems to care about her lonely existence. WOW!!! This is a brilliant novel. The amount of tension the author has brought to this story is amazing. The reason behind saying this is because the majority of the story revolves around a single house with one character that has mobility issues; it's just gripping. Bree is the character and due to her isolation it lets us delve into her as a person and her personality. We learn of her struggles and her fears as more and more secrets are uncovered that she shouldn't be digging into. I also have to say I love the supporting character that is Bree's' cat; he is quite the character himself and brings a smile to your face. All in all this is a fabulous book and look forward to reading more from this author. The Window is a really interesting look at an outside view of a traumatic event. Bree’s look from across the street at the aftermath of the crime is reminiscent of Rear Window then things get ever more complex with revelations from the past coming to light. By the time you reach the surprises near the end you’re not quite sure what’s real but you’re definitely entertained. I voluntarily reviewed this book. This book was interesting. Bree was stuck in her house by her sickness. Her only view of the world was outside her window. Strange things start happening and she is caught up in something she could not dream up. It was an intense story one that you will love. I enjoyed this short story but I did not care for the ending. It was abrupt and felt unfinished. I am hoping there is a sequel or something, to solve the unsolved. However, it is well-written and the characters are so likable. Hoping for more. I wasn't so keen on this one. The house location didn't match up with the previous book. I still enjoyed but the story felt too limited being just in the one house.